Daylesford is one of the most famous farm shops in the UK and was without a doubt a pioneering shop when it was established in 2002 by Lady (Carole) Bamford, wife of Lord (Anthony) Bamford, chairman of JCB, one of the world's biggest construction equipment manufacturers. The Daylesford shop and café are situated on a 1,700 acre estate in Gloucestershire, which also houses an organic farm, as well as the Bamford's family country house. Over the years Daylesford has branched out with three London shops & cafés, located in Notting Hill, Pimlico, and Marylebone, but a more recent addition is The Wild Rabbit, a pub with rooms in Kingham, less than two miles from Daylesford. Lady Bamford acquired the pub early 2013 (when it was called The Tollgate Inn), and reopened it later that year, after an extensive, top-to-toe £1 million plus refurbishment, as The Wild Rabbit. Initially at the helm of the kitchen was Adam Caisly, former senior sous-chef at Le Gavroche and private chef of Lady Bamford, and the pub managed to put itself quickly on the food map of Britain, with Michelin naming The Wild Rabbit "Pub of the Year" in their 2015 "Eating Out in Pubs" guide. Adam Caisly left the pub early 2015, and was shortly after succeeded by the talented Tim Allen, former executive chef at Michelin starred Launceston Place in London. Tim Allen started at The Wild Rabbit in October 2015 and a year later the pub was awarded a Michelin star (2017 guide). First to arrive was grilled cured mackerel, placed on top of some soft cubes of potato and served with dill snow. 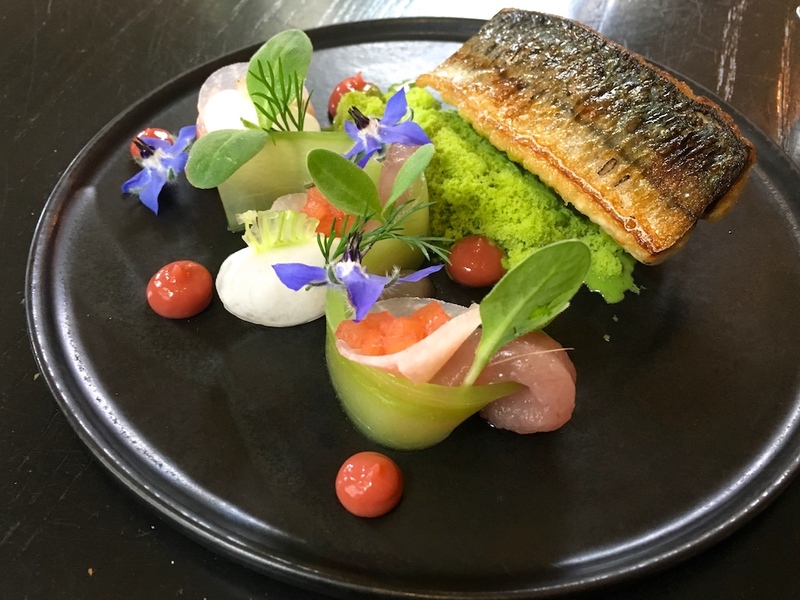 On the other half of the plate was a ribbon of compressed cucumber with fresh, marinated mackerel, little kohlrabi cones with pickled rhubarb, dots of rhubarb puree, and a garnish of borage flowers carefully arranged around it. An attractively presented dish that really invited you to try different flavour combinations. The grilled mackerel worked wonderfully well with the sourness of the pickled rhubarb, but equally well with cool herbiness of the dill snow and the cucumber. This last combination also had a great temperature contrast, the warm moist mackerel against the cool dill snow and cucumber. Even better was the next course of ultra-fresh Orkney scallops (opened just 45 minutes before serving), lightly caramelised, and beautifully paired with grilled Cevenne onions, English teardrop peas, pickled shallots, buttermilk crème, thinly sliced Morteau sausage, and finished with a drizzle of Cevenne onion honey. 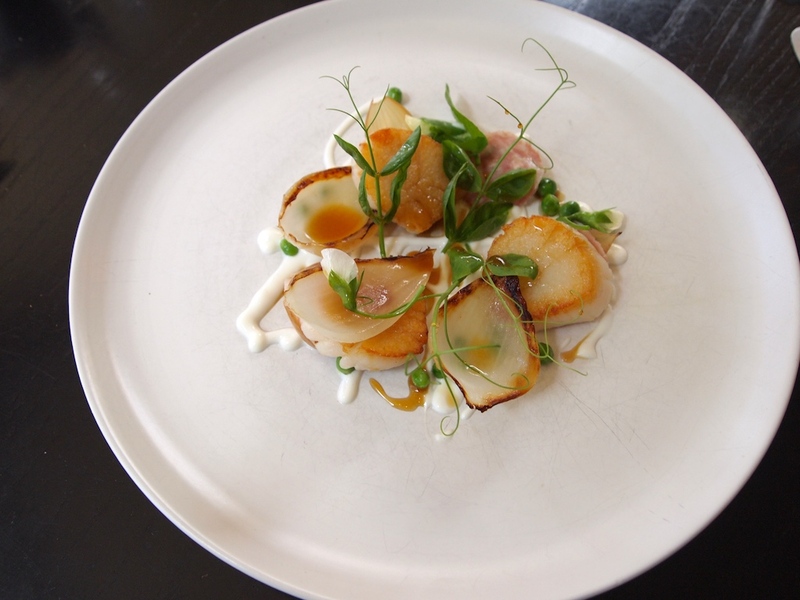 Dazzling scallops, which had a terrific velvety and fleshy texture and their incredible sweetness combined wonderfully with the distinct and lush sweetness of the Cevenne onions. Lovely crunch and balance from the pickled shallots and fresh peas, and the sausage offered a nice, salty and smoky, counterpoint. An outstanding dish with exceptionally balanced flavours. 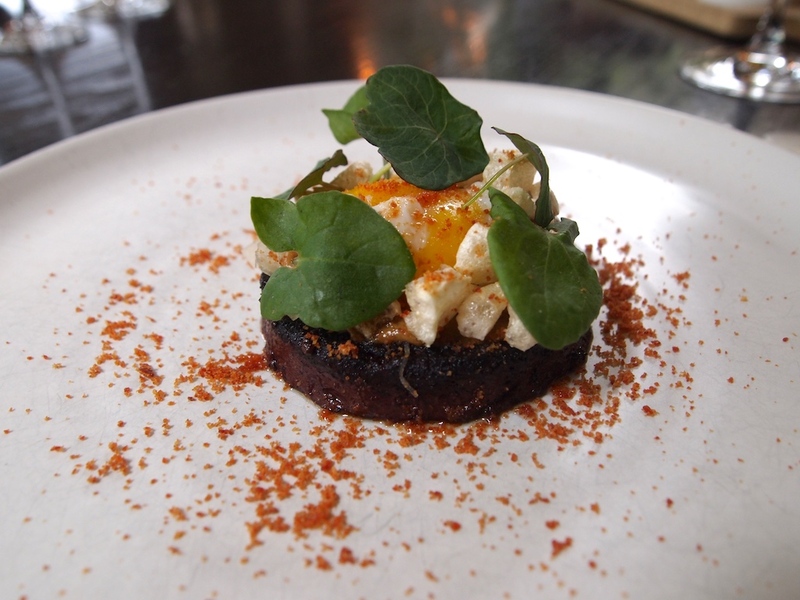 Next up was homemade black pudding "Royale" cleverly paired with a warm spiced mixture of gently crunchy curried pickled onions, thinly sliced fresh green apple, a soft and runny egg yolk, and garnished with pieces of puffed pork crackling, nasturtium leaves and a sprinkling of bacon powder. Skillfully made and well-seasoned black pudding, with a slightly crumbly texture and enhanced with little cubes of soft pork jowl. The addition of the curried onions worked wonderfully, bringing an extra dimension to the dish and at the same time providing a delightful (sharp) flavour and texture contrast. Not to mention the acidity of the nasturtium leaves which helped balancing the dish nicely. It was clear to see that a lot of time and skill had gone into creating this dish. Tim Allen told me later on Twitter that it took him 5 months to get the recipe right. 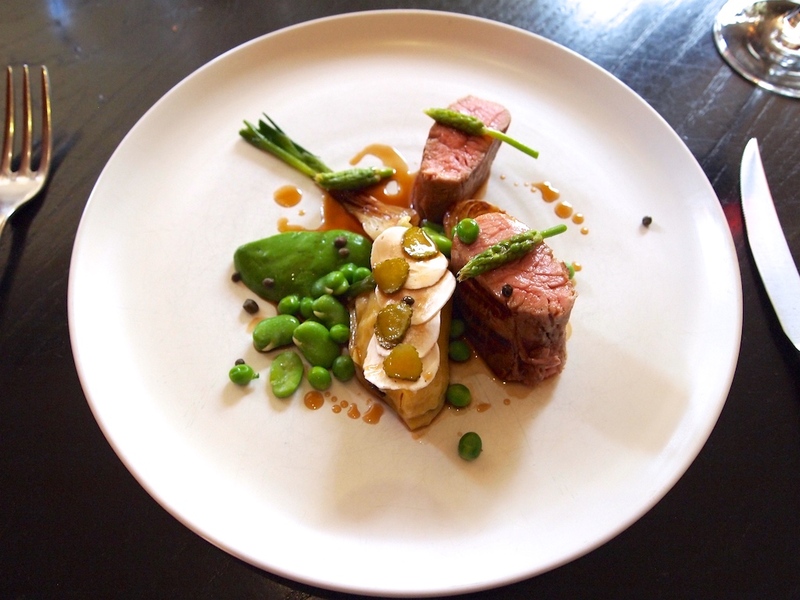 The fourth and main course was beautifully cooked veal, served with pea, broad beans, pea puree, and barbecued spring onions. Exquisite, meltingly tender, veal with a nice barbecued (Big Green Egg) finish, and complemented by a delicious, well-reduced veal jus, that had an elegant thickness to it (not too sticky). Best of all though, was a perfectly made agnolotto with a truly magnificent filling of soft veal sweetbread and, at the exact opposite of the texture spectrum, crunchy gherkins; a highly addictive flavour and texture combination. A perfectly executed dish that delivered satisfaction in spades, the gherkins bringing just the right sharp tang against the richness of the sweetbread. Time for dessert. 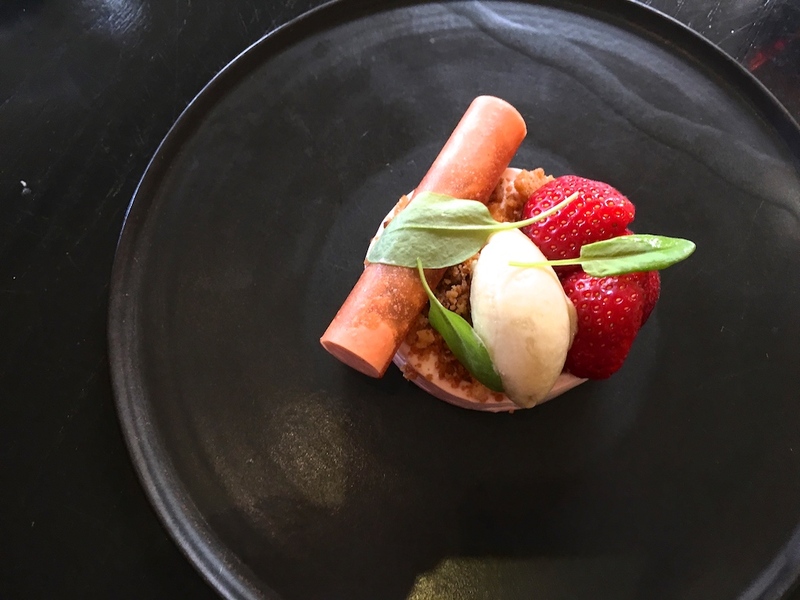 Strawberry cheesecake with some strawberry jam inside, and topped with fresh Gariguette strawberries, toasted crumbs, green rhubarb sorbet, and a crisp strawberry cannelloni filled with strawberry cream and pieces of caramelised white chocolate. An excellent cheese cake with a light and creamy texture and good clear flavours, rich but not too heavy, and the caramelised white chocolate delivered lovely mild, smoky notes. Great textures too. To people who are familiar with chef Tim Allen's cooking, last October's Michelin star accolade came as no surprise. Michelin's definition of one Michelin star used to be "very good cooking in its category" or "a very good restaurant in its category", but with the release of the 2017 guides they've changed the definition into "high quality cooking, worth a stop". It's a good thing they've changed the definition, because The Wild Rabbit is not just "a very good restaurant in its category" but it is in a category of its own. If you use the front entrance you enter the pub part of the establishment, a modern pub which also serves cocktails, but if you use the back entrance (or walk past the bar), you enter a bright and spacious restaurant with a modern open plan kitchen. Either way, the restaurant feels right as soon as you walk in. It's been a little more than 18 months now since Tim Allen became executive chef at The Wild Rabbit and he has settled in really well. His cooking style hasn't changed radically from his time at Launceston Place; his experience and technical ability still shines through in all the dishes with attractive, well-considered combinations. That said, I did sense that joining The Wild Rabbit has allowed Tim Allen more creative freedom and room to explore new ideas. There's obviously a fruitful collaboration with Daylesford farm, but he the restaurant is not subservient to Daylesford produce, and uses top ingredients from both Britain and abroad, always knowing the exact provenance, an all-important aspect if you're e.g. making your own black pudding with fresh pig's blood. Highlights of the meal were the scallop and onion dish and without a doubt the black pudding "Royale", both dishes cooked with authority. 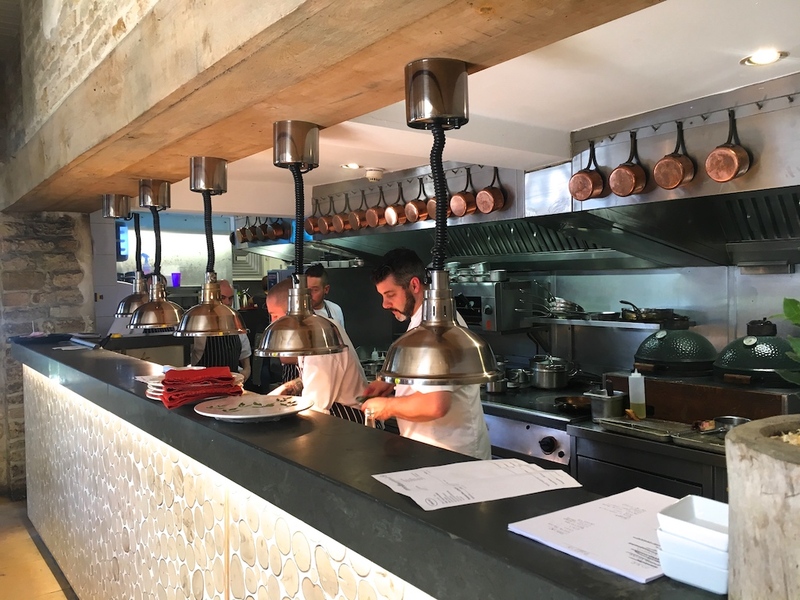 Tim Allen's cooking is absolutely worth a stop if you're in the Cotswolds, or the 90 minute train ride if you're travelling from London.